When your business needs to stay running 24 hours a day, 7 days a week you know that down time is simply unacceptable. It is for this reason that IT Infrastructure Monitoring software and tools have been developed, and allows IT professionals to monitor and receive alerts relating to network equipment and performance in the event of there being any issues – Today we'll Review some of the Best software for managing your IT infrastructure and how they can assist you in keeping uptime at an all time high and minimize any network and server issues! This is an excellent way to stay ahead of any trouble on your network, and can mean the difference between being open for business and losing money due to a system outage. 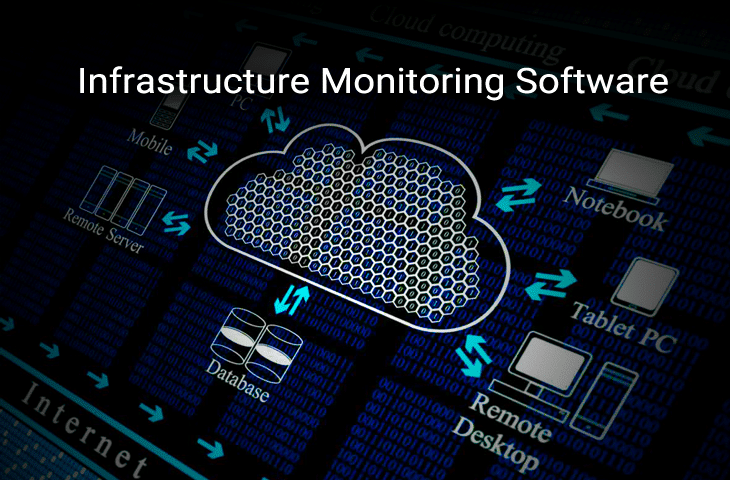 We will take a look at some of the most popular examples of Network Monitoring software, as well as some of the most common features that you can expect to find. Let’s get started! 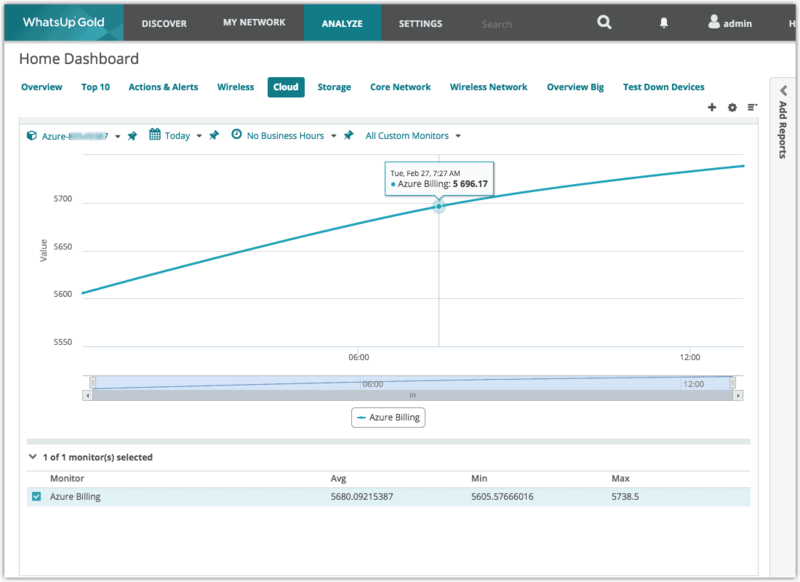 Solarwinds Network Performance Monitor (NPM) is a comprehensive network monitoring suite that is said to reduce network outages while improving performance. It has advanced features that make it an excellent choice for anyone that is tasked with managing and maintaining network infrastructure. 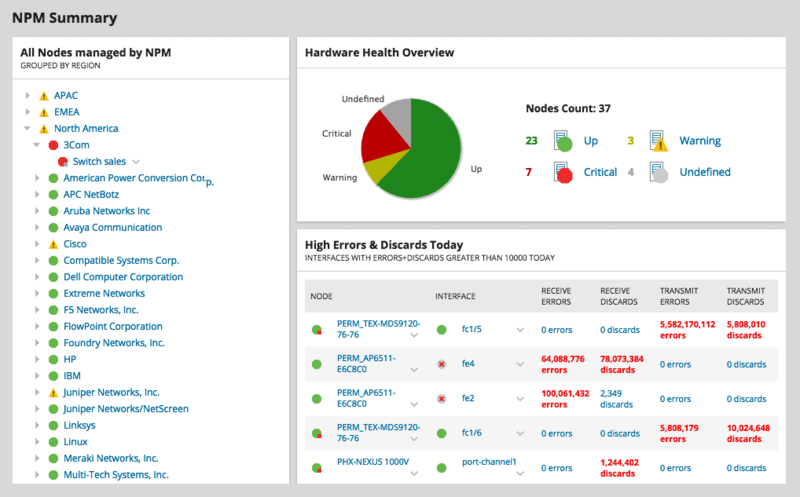 Solarwinds NPM will let you take control of your monitoring, and will let you troubleshoot and diagnose issues on your network before they become a bigger problem. NPM lets you monitor specific devices on the network, or even being able to trace an entire node map. 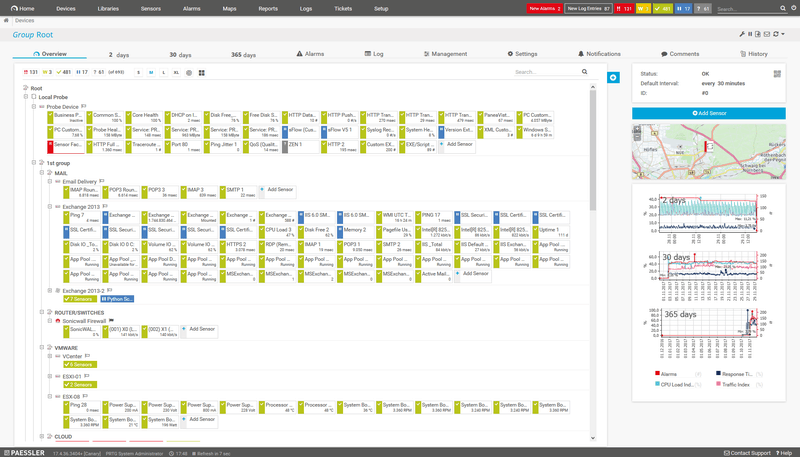 Customizable Dashboards are also available, which means that you can create specific views for different teams. 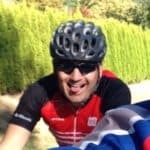 This simple approach clears the clutter that can accompany such a large scale monitoring application, which makes for a highly usable product that is simple to use but does not sacrifice quality or features while doing it. 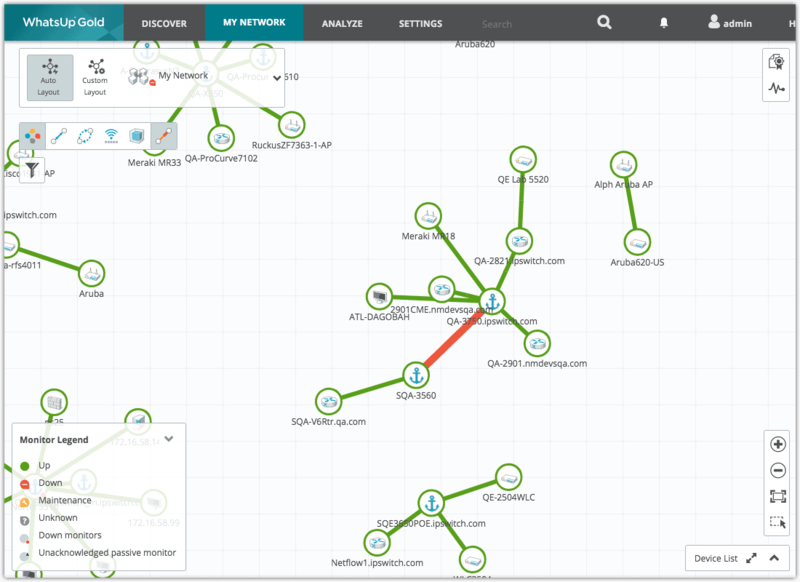 Netpath is a feature that helps IT professionals when they need a visualization tool, and is especially useful when trying to diagnose and trace network faults. 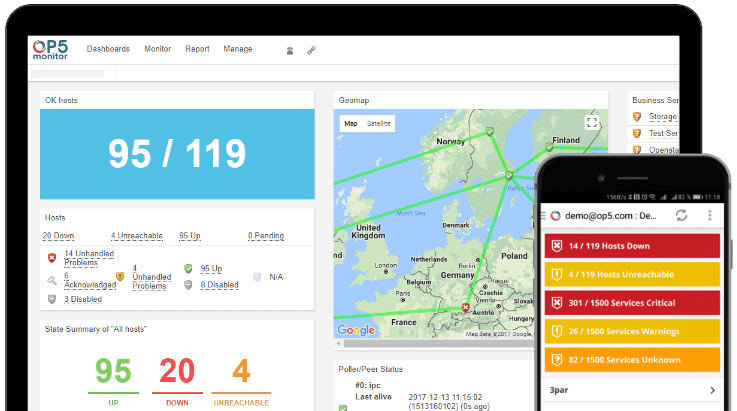 Solarwinds NPM is able to deliver detailed monitoring information and analysis of your network devices’ performance thanks to the use of SNMP. This means that any devices that use the protocol can communicate with Solarwinds NPM and give it a wealth of information. These devices include PCs, Laptops, Servers, Network Switches and Routers, Wifi Access Points and much more. Just about anything with an IP address and SNMP will be able to communicate with Solarwinds NPM. Nodes: A Node describes an entire device, and not just its interface. Devices such as Routers, Switches, VM and physical servers as well as hardware firewalls all count as nodes in Solarwinds NPM. Interfaces: Interfaces refer to Ethernet ports on a network device. These include switch ports, physical interfaces such as network cards, virtual interfaces, sub interfaces, VLANs and other points of network based traffic. Volumes: These are network storage elements that can be monitored remotely. This is a comprehensive software suite that offers great functionality and many advanced features. This is an ideal choice for corporate and enterprise environments that need a highly effective monitoring solution with decent support and reasonable licensing costs. PRTG has been developed by Paessler, and it has been marketed as a simple to use monitoring application that offers all of the important information that you could possibly want at a glance. The program itself can be started in just a few minutes, and offers compatibility with many mobile devices, thanks to the use of a functional web interface. PRTG works by using an intelligent network auto-discovery feature, which can scan segments of a network by pinging the ranges of IP addresses that have been defined by the operator. This allows PRTG to automatically recognize as many devices as possible, and can then create the right amount of sensors to accomplish the monitoring tasks that you have In mind. PRTG isn’t quite done though, as they also offer a very useful mapping feature that lets users create the most up to date and relevant web pages with up to the minute accurate details. Alerts make up the next part of PRTG’s repertoire, and these can be relayed to Android and Apple devices, which makes sure that your IT staff are able to respond to system issues both day and night. PRTG comes in a few different licensing options, each with its own amount of sensors and options. The first, free version costs nothing, but is limited to only 100 sensors. Further pricing details can be found below. As the license prices are determined by the number if sensors that are employed on the network, there are several different options to suite your budget. A formal quote can be requested from here. 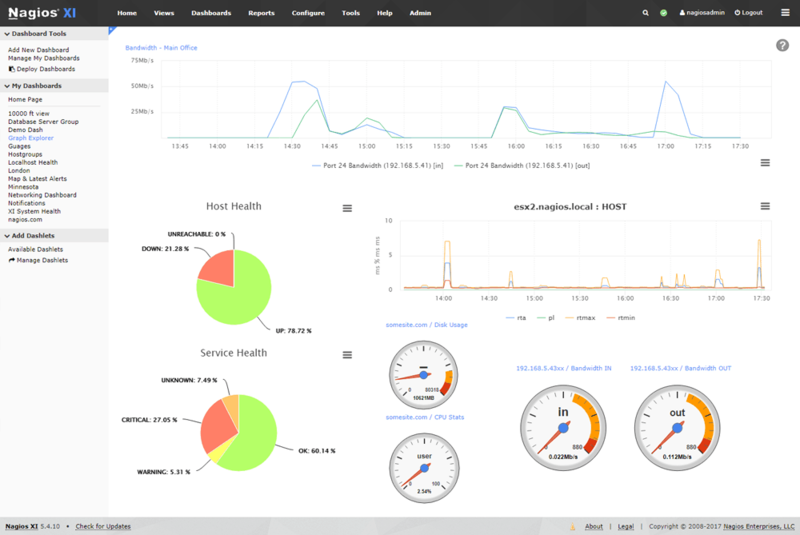 OpManager is another network monitoring suite that has some great features and functionality all rolled into one. On the surface it does all of the essential tasks that you would expect from such an application: Realtime Monitoring of network devices and resources, Intelligent Reporting and it is easy to setup and install. Other, more advanced features include Reactive network monitoring, where the application can fix errors and generate alarms, or even read syslog and trap messages. Threshold based Monitoring is another great feature that detects and identifies network issues, and then begins troubleshooting steps. You can set the specific performance metrics that you wish to monitor, giving you the freedom to customize your monitoring environment to suite your every requirement. Networks are complicated systems that are getting even more difficult to support and troubleshoot as time passes. OpManager finds its way into our list due to its robust software dsesign and comprehensive network monitoring capabilities. Like so many other network monitors, OpManager uses an SNMP scanning tool to interrogate devices on your network, and give you all of the important information that you need to know about your devices. System administrators will be delighted with the full set of features that OpManager ships with. All devices, both physical and virtual can be easily detected on the network and then added to the interface without much effort at all. Dashboards, maps and even server cabinet renders are possible, giving your support staff as much information as they need so that they can troubleshoot and repair errors on your network whenever they arise. Check here for Manage Engine’s OpManager online quotation query form. 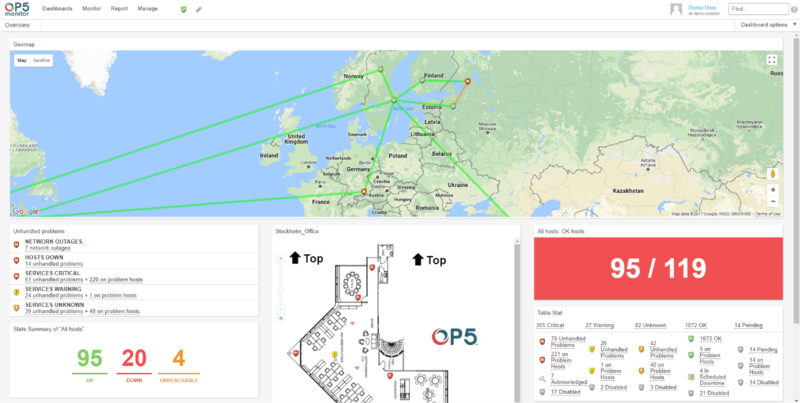 OP5 is an IT Monitoring Software Solution from Sweden, but has been created to serve a global market. It has its roots based in open source, and offers users a surprisingly comprehensive solution right out of the box. 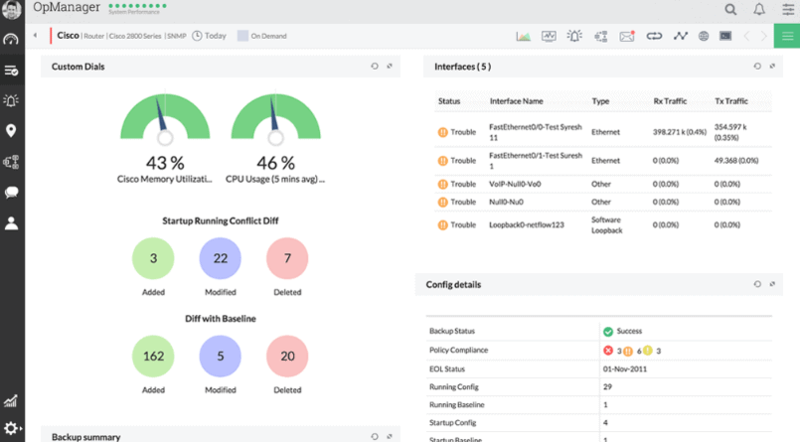 OP5 offers a scalable, automated monitoring solution that is sure to give you all of the functionality that you need to monitor, administer and troubleshoot any device or issues that should crop up on your network. One of OP5’s best points is the fact that it is completely free to download and use, however it is only fully functional for 30 days with unlimited devices and full support. Thereafter, you will be reverted to just 20 devices but you can use the application in this mode indefinitely. When you buy the product, you get full functionality and user support. There is all of the standard network monitoring functionality that you would expect: real time live monitoring of servers, PCs and network devices, as well as maps and connectivity notifications if any of your devices go offline. This is an excellent troubleshooting tool that gives you excellent information about what is happening on your network at any given time, and the mobile app is a nice touch as well. Pricing: For additional pricing information check the link here. Nagios is a server and network monitoring tool that is suitable for corporate and enterprise businesses with medium to large scale networks, although it also works just as well on smaller networks. It is structured as a comprehensive IT infrastructure monitoring suite that provides monitoring and alerting systems. It is able to monitor applications, services, operating systems, network protocols, systems metrics and network infrastructure. One of the best parts of this product is the fact that you can add additional functionality to your monitoring suite by using third party add-ons. There are a comprehensive series of dashboards and monitoring webpages that can be looked at, allowing your IT staff to zero in on any issues or abnormalities as they appear. This is excellent for large networks that have hundreds of devices that need to be monitored closely. Maps are also available, with visual links for easy troubleshooting and error tracking. Bandwidth monitoring is also available, which means that network performance and data usage can be tracked and monitored, giving you the power to document and report on any abnormal findings. 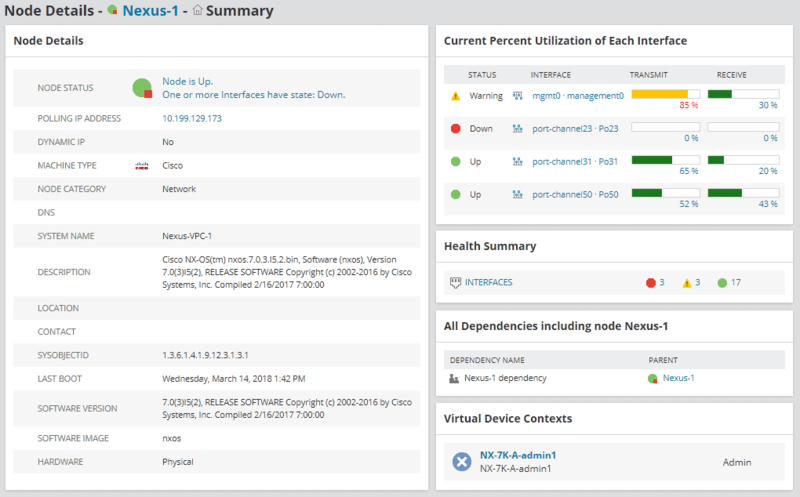 Nagios XI is an excellent suite of tools for anyone that wants to stay in control of their network, with great visual aids giving the user a proper overview of activity. There are many great points to like about Nagios, and its plug-in capabilities give it somewhat of a competitive edge over some of its rivals. 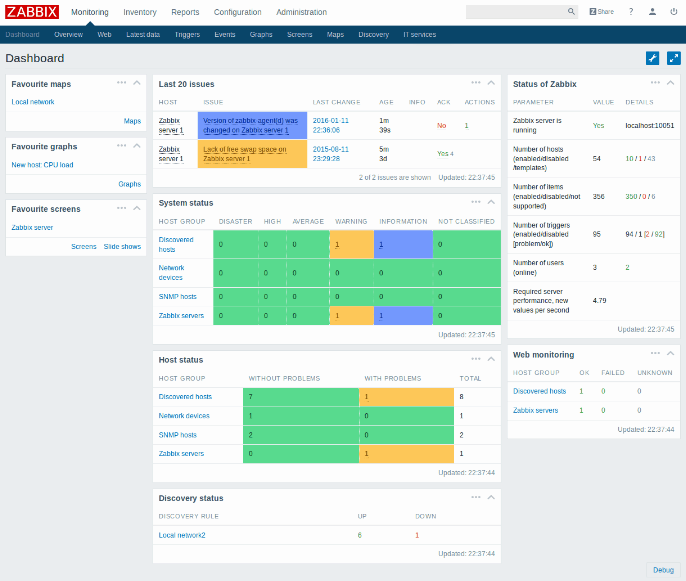 Zabbix is a 100% open source application that quite literally allows you to monitor everything and everything on your network. It offers network monitoring, server monitoring, cloud monitoring, services monitoring, and even KPI and SLA monitoring for good measure. We will be focusing on the network monitoring. It is a truly comprehensive solution, and monitoring capabilities include network bandwidth usage, packet loss rate, interface error rates, CPU and RAM utilization, open TCP connections, aggregates of core routers, and much more. 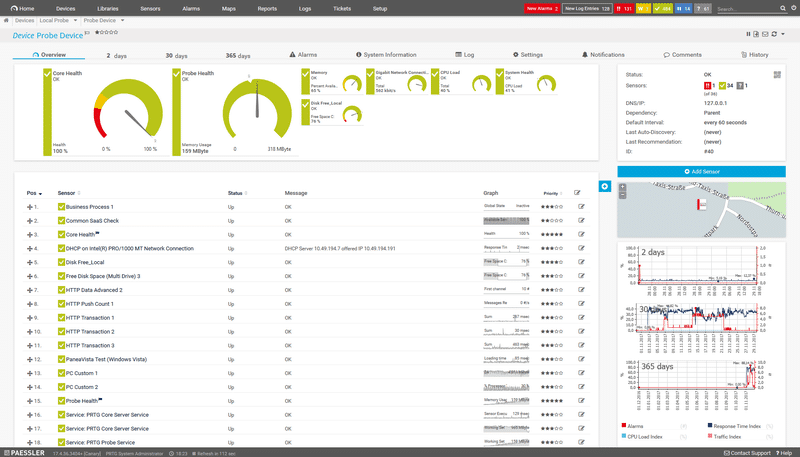 The Zabbix agent can be installed on a wide variety of platforms, offering enhanced stats and data for the user to draw information from, and the wealth of data that is available becomes essential for building a holistic view of the current state of the environment. It has a small footprint and does not use many resources, which is great because you never want a monitoring agent to use system resources to such an extent that your system starts to slow down. Zabbix offers polling and trapping support as well, so all of your passive and active checks can be handled by a singular application with no need to rely on any other data sources. 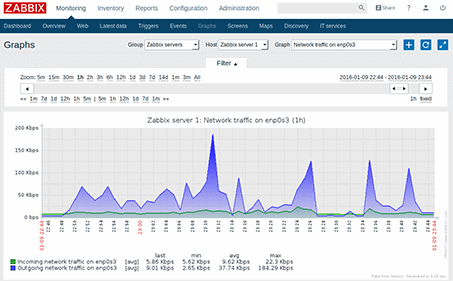 Zabbix can monitor networks, CPU loads, memory, disk usage, services, applications, files and logs, as well as uptimes, users and performance counters. Pricing: Free and Open Source, although paid support is available if you require it. 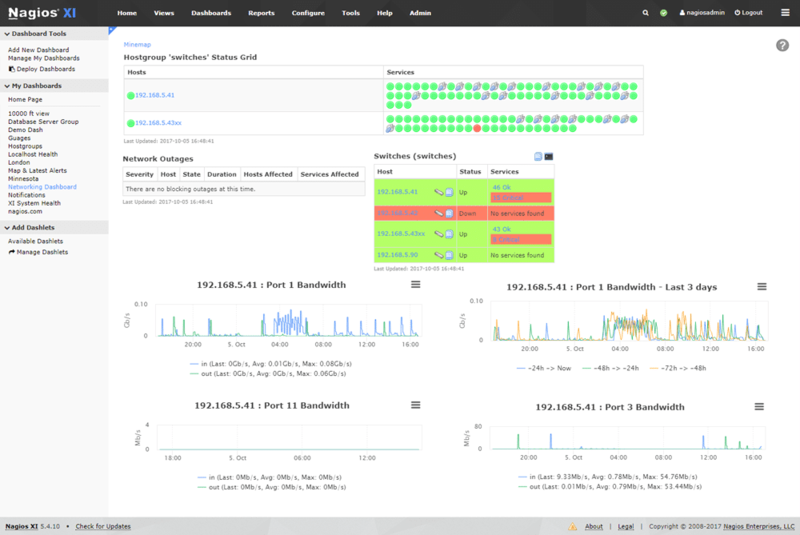 Whatsup Gold 2017 is another monitoring suite that has a strong focus on network connectivity and performance. It is able to monitor cloud infrastructure such as AWS and Azure, and can automatically discover, map and monitor Amazon Web Services and Azure Servers. This allows you to report and monitor status performance of your online environment via Whatsup Gold 2017’s own native API. 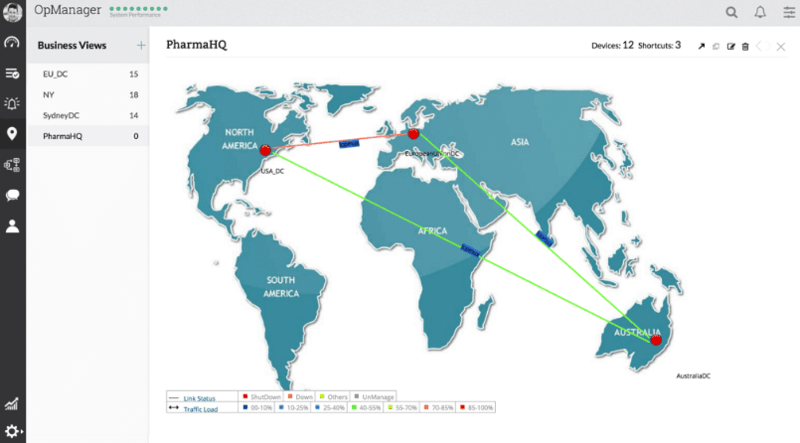 The new overlay features offer a visual tool for users to picture clearly the entire network and components throughout the regions, which looks very similar to a heatmap. Congested links highlight as red, while optimal connections remain green. Wireless monitoring features strongly win Whatsup Gold 2017, and environment layouts can be generated very easily, helping again with the visualization of a particular environment based on the network layout and components that are found there. Dashboards also feature strongly, so you can access all of the essential data that you need from one central location, while active alerts and warnings provide real time awareness to your daily checks. Pricing: Those wishing to find out about pricing can check the following link here.